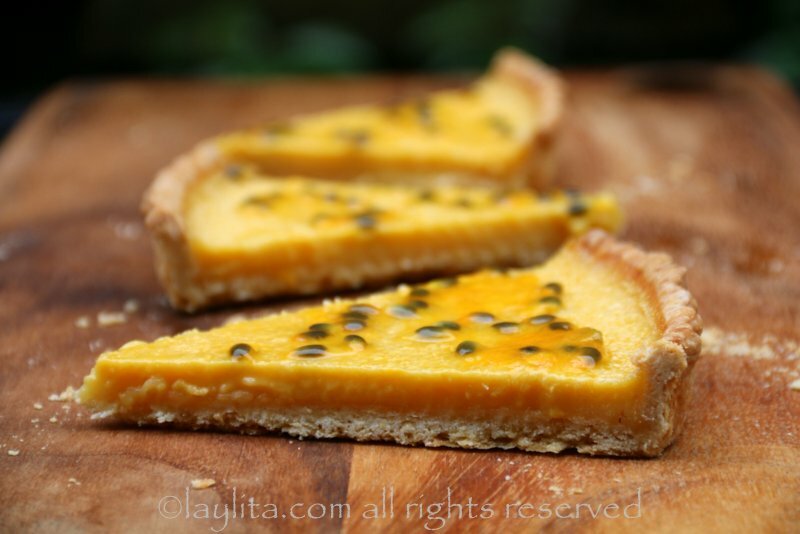 I love maracuyas or passion fruits. 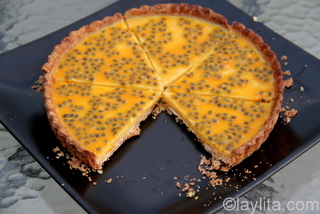 The smell brings back childhood memories of drinking refreshing glasses of passion fruit fresco or juice; it was especially good after a long walk home from school or after running around on the farm. 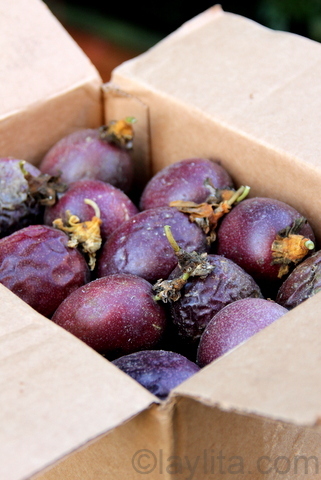 It also brings memories of just picking ripe ones from the vine, biting the hard skin off and sucking out the fresh fruit. I previously posted a recipe for passion fruit tiramisu that I made in Ecuador this summer and was complaining about the lack of passion fruits in the US and the high cost when you did find them. 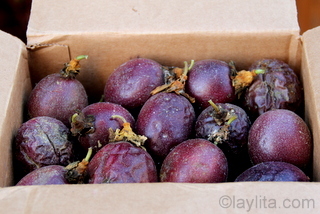 I got a message from a lady who owns a farm that grows passion fruit in California and sells them at a lower cost that you pay at the grocery store, so I ordered a good amount of them. I could have easily just eaten them all as is, but I also decided to use some for cooking and making cocktails (of course!). Make sure the unbaked tart shells have rested at least 30 minutes in the fridge. 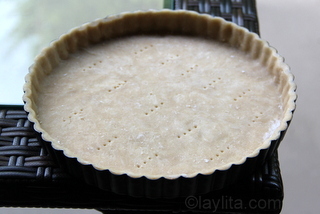 Cover the tart shells with parchment paper and fill with rice, beans or tart weights. 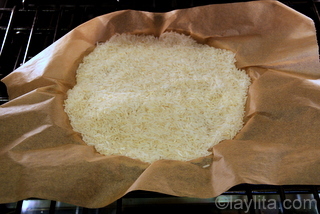 Bake for 15-20 minutes, and then carefully remove the parchment paper with the rice/beans/weights. 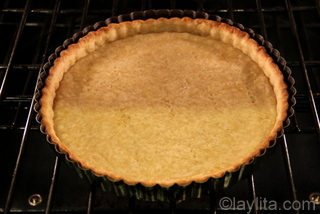 Bake for another 5-10 minutes or until the bottom of the tart shell starts to get golden. Combine the sugar, the passion fruit juice and lemon juice in a mixing bowl. 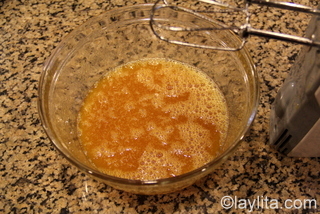 Use an electric mixer to mix until the sugar is dissolved. 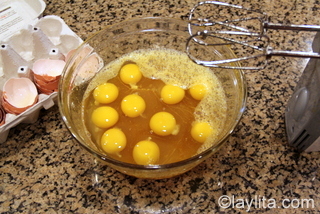 Add the eggs and continue mixing until well incorporated. 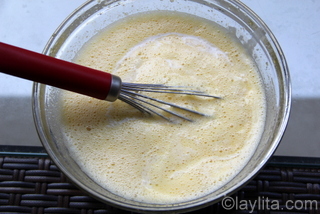 Use a whisk to stir in the cream. Strain the passion fruit filling using a thin mesh strainer. 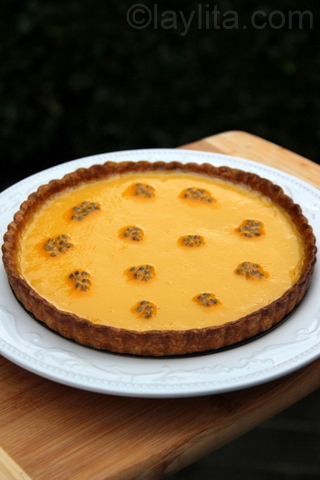 Pour the passion fruit filling into the pre-baked tart shell. This filling will not rise or increase in volume so pour in as much as you can. Bake at 350F for 20 minutes, the tart filling will be set by then. Remove from oven and let the tart cool down. 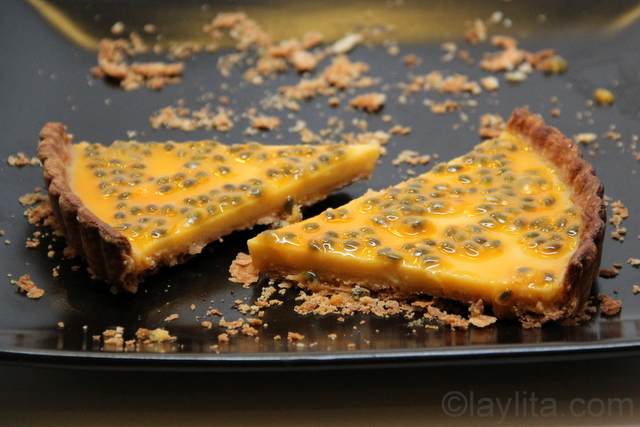 Top with fresh passion fruit right before serving. 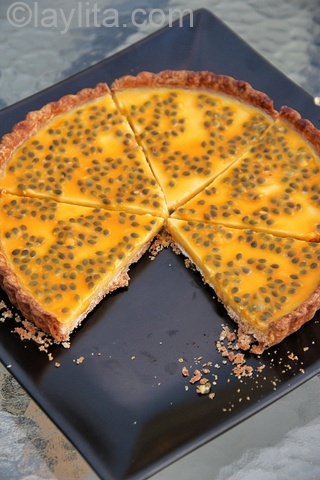 The great thing about this tart is that you can make even without fresh passion fruit, you can use the frozen concentrate for the filling and it works perfectly. 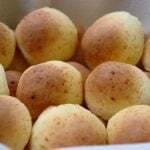 Most Latin grocery stores sell frozen passion fruit pulp, this list of Latin food resources might help if you are looking for places to purchase it. If you have plenty of fresh fruit then you can make your concentrate by blending the pulp with a tiny bit of water and then straining out the seeds, for the topping I use the fresh pulp as is, seeds included. If you only have a few fresh fruits then use the frozen pulp for the filling and fresh ones only for the topping. 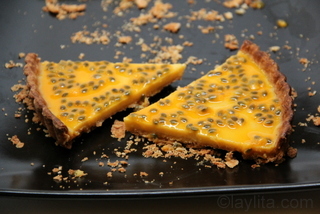 I pre-baked the tart shells for this passion fruit tart, the filling just needs about 20 minutes to bake for it to set, so I wanted the tart shells to be almost fully baked. 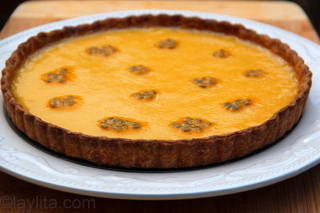 I initially did a test where I used a chilled unbaked tart shell and put the filling directly without pre-baking or blind baking the tart crust. 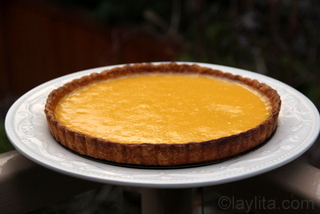 The test tart was decent – it had to bake for about 40-45 minutes, but the texture of the filling was not as smooth and creamy as with the tart where I used the pre-baked shell. 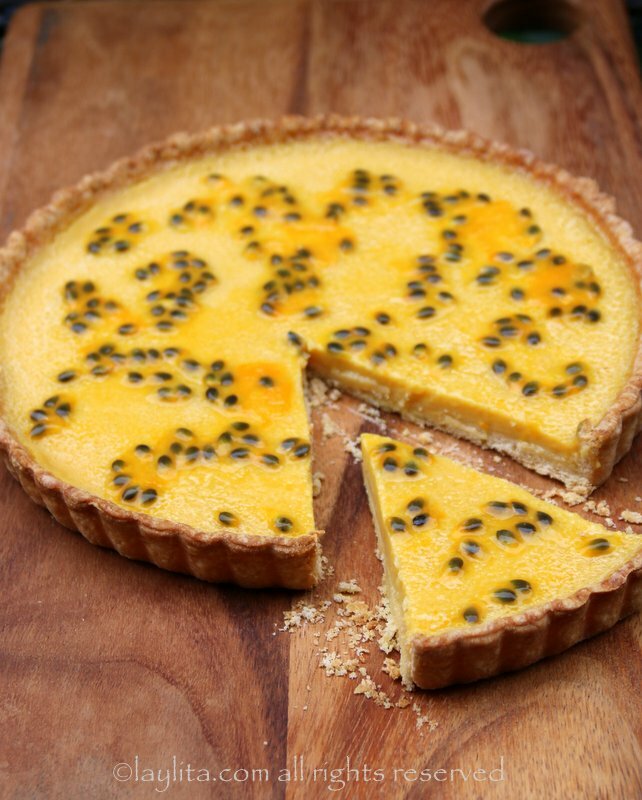 The quantities are for 2 tarts, trust me this tart is so good, that you will regret it if you only make one! This was my first time baking a fruit tart so flipping that dough over into the tart pan was hard for me. My dough might have needed to fridge longer. 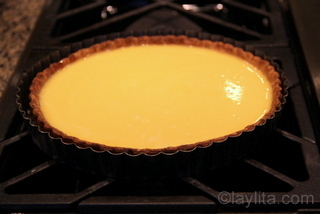 I also needed to cool the tart a lot longer. I heard after the tart is done baking, it’s good to leave the oven open and let it cool for an hour. So I’m gonna try that next time. I really do wish I made 2 tarts now though. It was so good. SO good. 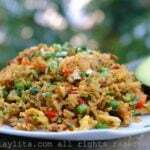 Thank you for the recipe Laylita. I’ve been loving maracuyas since I tried it in Brazil long ago while visiting a friend. I have to also special order them from my grocer only then they’ll ‘buy it’ for you. 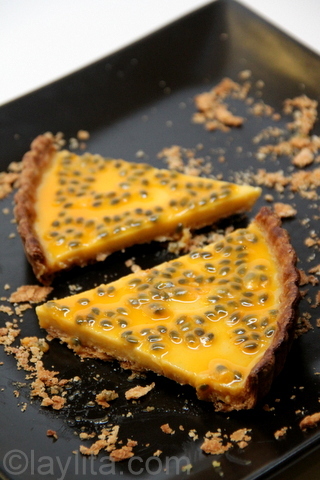 Tart looks amazing! That looks so good… does the farm you got the passion fruit from happen to have a website so the rest of us can check them out? Hi Zaylinda – They don’t have a website, but I can put you in contact with the owner if you are interested in ordering some.